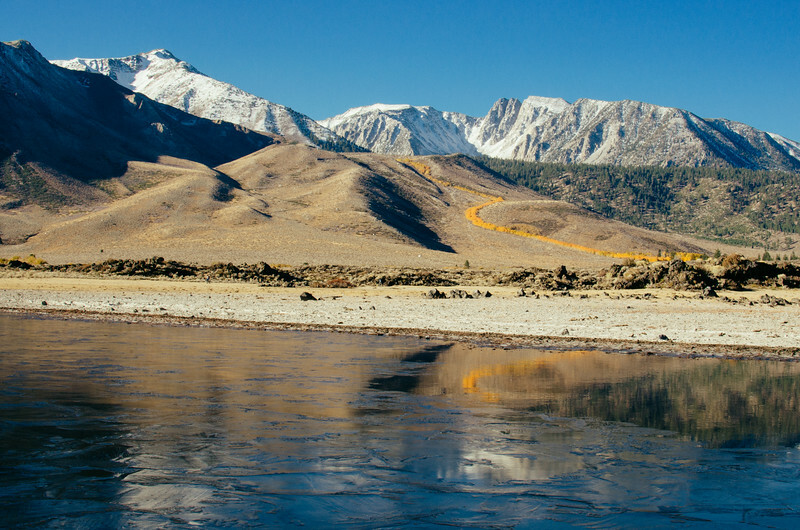 I just returned from a few days in the Eastern Sierra, where fall colors are peaking in many places. And, of course, Yosemite is back open -- just two days after I left. Thanks John Boehner! The above shot was taken near Mammoth Lakes of the aspens lining Laurel Creek. I had taken a photo of the creek in autumn in 2010, but was never crazy about the results due to poor light midday lighting. So I tried again, this time in the morning and from different locations -- some closer than above, some farther than above. I like this one best because it offers some context, showing how unique the ribbon of orange aspens are while catching just enough reflection (I couldn't find a spot that offered the reflection of both the aspens and the mountains but I'm kind of bored with photos of perfect reflections anyway). From a compositional viewpoint, I also like the framing, which loosely follows the rule of thirds. Bottom third: the frozen pond. Middle third: the mountains and trees. Top third: blue sky. And from left to right, there are three peaks in the left, center and right portions of the frame. Camera & Settings: Nikon D5100, Nikon 35mm 1.8 DX lens, handheld and shot in RAW and processed in Lightroom 4, using VSCO film presets. ISO 200, f/22 and 1/50th of a second. Left of the creek is the four-wheel drive road to Laurel Lake. There was a camper van on the road that looked like a boulder in my photo. Although it was very small, you don't see it above because I edited it out.